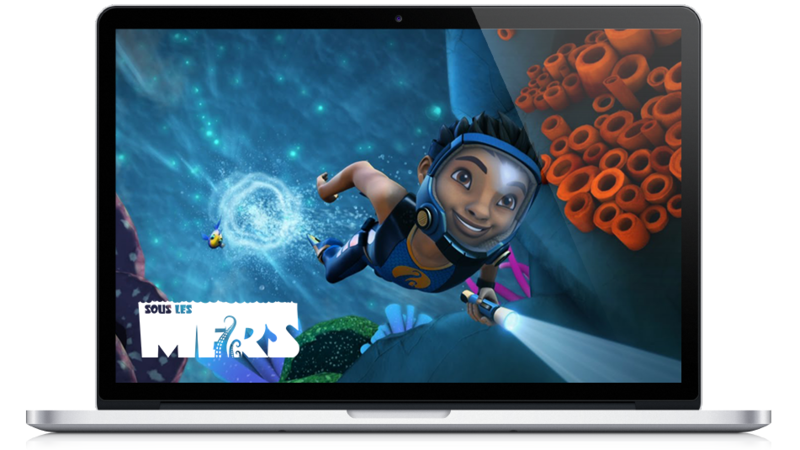 The purpose of this Social Media Campaign was to set-up and develop on the French market the social media presence of the animated series The Deep – known as “Sous les Mers” locally – to boost its viewership on France TV. The Deep — Sous Les Mers in French — is an Australian/Canadian co-produced animated television series based on the comic book created by Tom Taylor and James Brouwer and published by Gestalt Comics. The series follows the Nektons, a family of adventurous underwater explorers who live aboard a state-of-the-art submarine, the Aronnax, and explore unknown areas of the Earth’s oceans to unravel the mysteries of the depths. The show’s core audience are kids from 7 to 12 years old. The challenge was to create from scratch an awareness campaign to promote the launch of the first season of the TV show in France and drive viewership with a focus on families (kids & parents). The other challenge was the ability to reach such a young audience through social media as the target is below the age limit to have an account. Services like Facebook, Twitter, Instagram, Pinterest and Snapchat require account holders to be at least 13 years-old. We created a localized social media presence adapted for French audiences to optimize the promotion of The Deep / Sous les Mers. We also developed an engaging native content strategy mixing images and micro videos extracted from the show. The objective was to introduce all the aspects of the TV show to the target audience. This included all the characters, vehicles, and creatures of the series, as well as its ecological values. We also planned to add educational pieces to the mix. Our content strategy was designed to target on a daily basis the kids and their parents. Parents were a critical audience as — most of the time — they give their blessing to their kids with what they can and can’t watch. Educating parents about the show meant a higher chance for them to recommend it to their own kids. We also activated local family influencers. By giving them a sneak peek of the show in advance, they were able to talk about it in their blogs, Youtube channels and Facebook live to increase awareness. We created a dynamic and engaging Facebook page with a custom video cover and produced from scratch a full library of assets based on the marketing materials (images & website) and the TV show (videos). The campaign included a teaser (daily countdown, characters introduction), and then a minimum of one post per day on Facebook and Instagram. Based on the opening sequence of the show, we have edited a 30s video teaser in two formats (16/9 and 1:1) to tease the curiosity of the target audience on social media. Over the course of the 2-month campaign, we have created almost a hundred images and videos out of the promotional materials and the episodes provided by the production team.